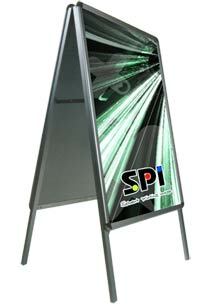 Info counter is a very practical and efficient way of advertising. Basically, it is a construction to which you tape posters and which enables more frequent change of materials on the counter, paying each time only for the printing. Info counter is portable, which multiplies its value substantially. Its most frequent use is at trade fairs.